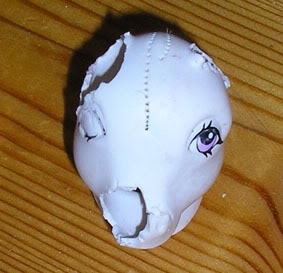 ﻿Whether it was the family dog, or the child herself who was the culprit, chewed body parts is extremely common in ponies. This used to be a life ender for the pony, but now thanks to Sculpey, Apoxy Sculpt, and similar products, just about any of these defects can be corrected. How well this turns out depends on how good you are at sculpting and mixing paint colors. Practice makes perfect, and hey, what you do can't look worse than those missing ears, right? Chew marks and dents in the body can be filled in with Apoxy Sculpt, sanded smooth, then painted over to match. 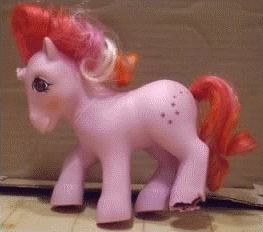 Lumps and bumps on a pony's body can be sanded with fine sand paper until smooth. Cookhuman at the MLP Arena provides more details about sanding: "Use a little acetone to soften the vinyl (apply sparingly with a cotton square). Start with a fine grit sand paper and sand the area. Hobby type sand paper film or sanding sticks made for plastics/vinyl tend to work much better and come in much finer grits than wood type sandpapers. Make sure you sand in one direction. Next sand with super fine grit paper. Then use a nail buffing block on the buff/shine side to smooth the vinyl back out. You can even add a little water to the area when doing this." It is commonly believed that age spots are the deterioration of the vinyl due to oxidization, heat, and UV exposure. However, in his book The Definitive Book on the Care and Preservation of Vinyl Dolls and Action Figures; Nicholas J. Hill explains that there is no such thing as "vinyl deterioration syndrome". Instead brown marks on vinyl can be caused from a reaction to sulfur (doesn't effect all vinyl), exposure to chlorine, and various fungi. 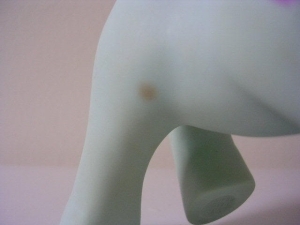 The brown spots commonly found on ponies is likely staining caused by colonies of fungi. These types of fungi live on the surface of the vinyl. spots as this was just one pony. athletes foot remedies will stop the growth. Photos courtesy nina85. Luckily, the general cleaning of ponies is quite simple. Dawn Dish Detergent will remove dust and a lot of surface dirt. Sometimes it also seems to brighten the pony's color. Mr. Clean Magic Erasers will remove more stubborn surface dirt and an OxiClean bath will get rid of more deeply embedded dirt and often brightens the pony's color. 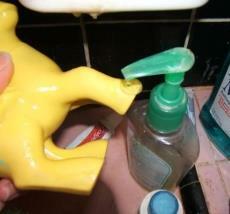 Use pipe cleaners or bottle brushes to scrub the insides of the pony. Every collector has his or her own favorite method and tools for general cleaning. You'll quickly develop your own as well! Yum-Yum at the MLP Arena has a cute cleaning video available here: My Little Pony - basic wash and style tutorial. To get to gunk inside your pony's body, you'll need something small and preferably flexible. Children's toothbrushes, bottle brushes, aquarium filter brushes, and long handled q-tips can all be used to scrub hard to reach areas like toes and ears. Make sure to research the products you decide to use, as some of them can have negative effects on certain ponies. More information is available on the Materials page. See the thread: List of Cleaning Products at the Arena for a more in depth discussion of products not covered here. 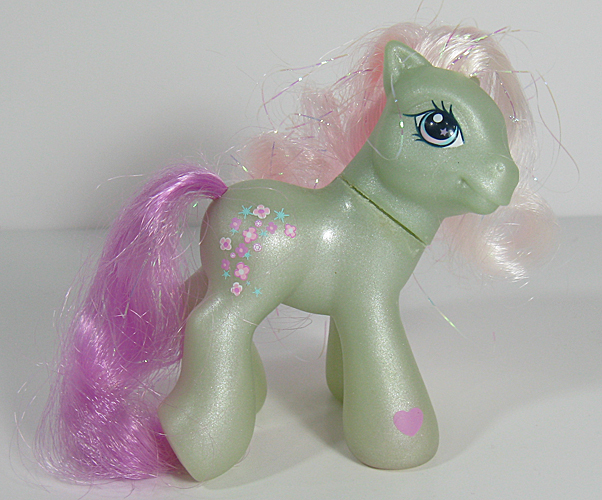 Dyeing ponies doesn't seem to have much usefulness for restoration and pretty much falls into the realm of the customizers. I do have high hopes that someone will eventually find a way to fix regrind and hide stains using dye, so I'm including a tutorial about it. 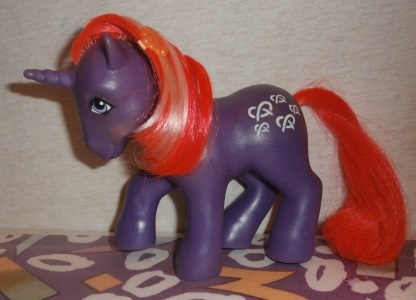 The dye doesn't affect eye paint or symbols, but it will dye the pony's hair so you'll have to remove the hair while dyeing and then replace it, or do a complete re-hair once you're finished. 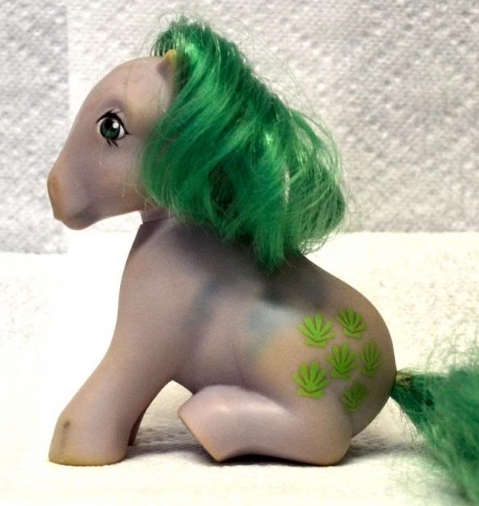 Keep in mind that the pony's original body color will affect the end result of the dye job. 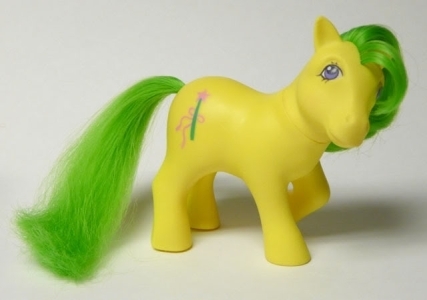 You probably can't turn a dark purple pony yellow, for example. Heat the water to boiling, remove from heat, and mix in your dye. You can make the pony darker and/or brighter by letting it soak longer, or by adding more dye to the water. You can always put the pony back in the mixture or add more dye, so ere on the safe side and use less dye at first. Continuously stir the water as your pony is soaking to keep the dye mixed evenly in the water. You can also hold the pony down in the water with tongs to help it absorb the dye evenly. 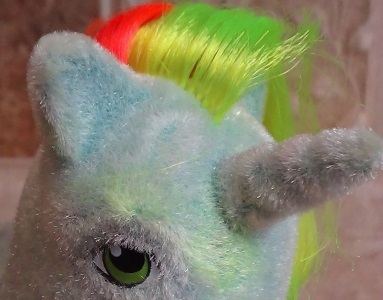 Different collectors have different opinions on whether or not to remove the pony’s head. After the pony has been in the dye for a few minutes, check for areas where the color is not changing due to the presence of excess glue. Sand off the excess glue, or remove it using acetone (this can also be done before you start the dyeing process, if the glue is visible), then continue with your dye job. Once your pony has reached your desired color, wash its body to remove any excess dye. If you also dyed its hair, you’ll likely have to wash it several times to get out all the extra dye. You might also want to give the pony an OxiClean bath. Rit Dye More for synthetics will help solve these problems. Email me if you try it and let me know your results! Shadowlark at the MLP Arena donated photos of a badly faded SeaShell that she restored using dye. She looks great! 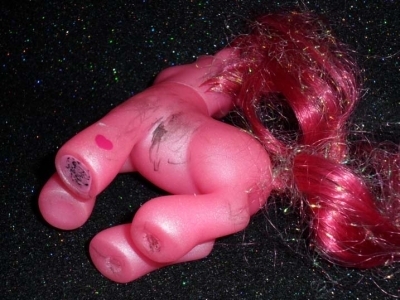 You'll need to remove your ponies' heads to clean inside them, while boiling them, and for projects like re-hairing. ​​Lots of regular pony heads can be removed by gently tugging and squeezing at them. Use a thin blunt object to pry off any sections that are still glued to the body. X-Acto knives are very popular for this and the blades can be reversed to help avoid accidentally cutting into the pony's neck or body. Pictured to the right, Sweetlittlejenny recommends a scrapbooking Scoop Tool for a safer version of this.. If you want, you can glue the heads back on using a craft glue such as Aleene's Tacky Glue or model glue, but you probably won't need to. Luckily, ponies usually have small indentations on their heads and bodies so you can see how they're supposed to line up. For really hard headed ponies, apply heat by dipping them in hot water or blowing on the neck seam with a hair dryer. This helps soften both the vinyl and the glue. Be very gentle when pulling on the head, to avoid ripping the vinyl. Soften the neck again to replace the head. If your pony is especially difficult, you can cut a piece out of the neck seam to make it go on more easily. Ponies, like pretty much anything, can grow mold and are susceptible to bacteria. Something known as an actinomycete causes many of the pink stains known as highlighter marks. Stains from fungi are also responsible for many of the brown spots knows as "pony cancer". Plastisized PVC is especially susceptible to mold and fungus because PVC is an acid system (which fugus likes), and fungi feed off of plastisizers. Common types include surface mildew, which can stain, a white fluffy mold that looks like dust, and dark mold that grows inside the pony. Molds can also cause spots that look like blackheads, which is often referred to as "smooze" in the pony collecting world. The same cleaning and stain removal procedures that work for other stains can be used to clean and disinfect mold. Smooze can be caused by dirt that has gotten into the pores in a pony's vinyl, like a blackhead in human skin. It can also be caused by the roots of fungal colonies. Mr. Clean Magic Erasers and/or boiling/soaking in OxiClean often removes it. For smooze that is embedded more deeply than this, you'll need to do some serious scraping. Here's a lovely tutorial courtesy Rhys: Pindot Removal. Run the water really hot, until it steams. Be careful to keep your fingers away from the stream! Now, after waiting for the water to get hot we take the pony and hold one affected area under the stream. For smooze removal, its best to tackle one area at a time. You may have to hold the area under the stream for a minute or two. What we are doing is using the heat to open up the pores in the plastic. It doesn't hurt the pony, nor is it noticable. It just allows us the ability to remove the smooze. Once you think its been long enough, add a dallop of anti-bacterial liquid soap directly to the smoozed area. Now, lather the soap, rubbing it into the affected area. Once that's done, use your fingernail (or steel brush, you poor, poor fingernailless friends) to scrape back and forth across the smooze. Like you're trying to scrape a sticker off a packaging. Really scrub. Rinse off the soap and check the area. This is where patience comes in. Some of the dots should be gone, but more than likely, you're gonna have to retreat. Hold her back under the water again, after a minute, lather, scrub, rinse, repeat if necessary. Ears - easiest to clean, Feet - next easiest, Wings - harder, but not difficult, Necks/bodies - woah, takes a TON of time, but do-able most of the time. So grab your smoozed ponies, and get to cleaning!" 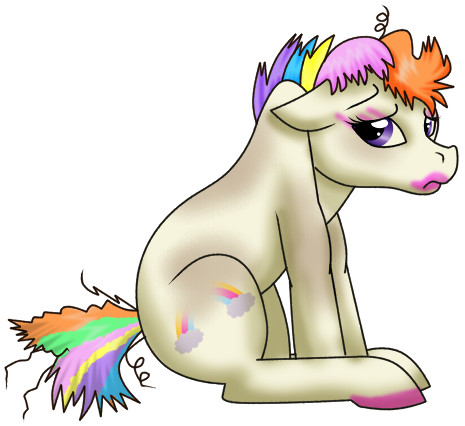 Sometimes raised dots and bumps appear on a pony's head or body that contain fluid or white goo. The bumps themselves are usually white or brown, but can be other colors. 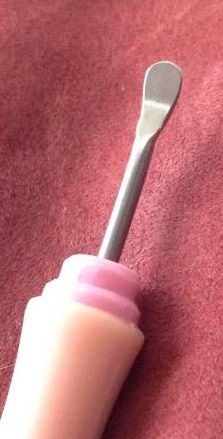 You can squeeze or prick the bump with a needle and let anything inside drain out. Once finished, disinfect the area with any product you prefer, in case this is a type of mold. Information courtesy Raemarie. ﻿Similar bumps may also not have fluid inside. ﻿Theories on what causes these range from a reaction to heat to reactions to chemicals in the pony's environment. 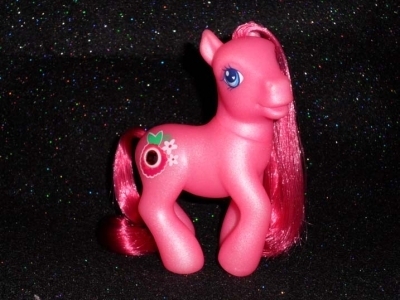 Dark colored ones may be a form of pony cancer. It doesn't hurt to disinfect these, just to be safe.﻿ Photos courtesy Raemarie and Sea_Breeze. Plasticizers are chemicals added to PVC to make it malleable. When it starts to leach out you can tell because the pony's body starts to feel sticky. With some of the smaller accessories, like Brandy the dog or Twinkles the cat, sometimes it causes their paint and faces to smudge off. This can happen both inside and outside the pony or accessory. 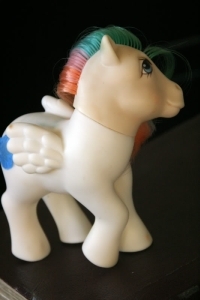 Once the plasticizer is mostly gone, the pony's body will be hard and un-bendable. You can soften the pony temporarily by applying heat (with a blow dryer or by boiling, for example), but the body will harden again once the pony cools down. Formula 9-1-1 was developed for the purpose of cleaning leaked plasticizer. You will need to apply it repeatedly until the plasticizer migration has stopped. Use caution as it can remove cosmetic features such as eyes, symbols, and blush. 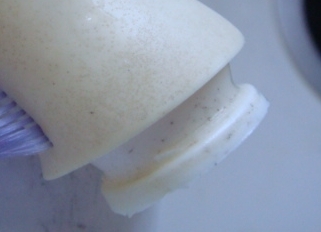 Hydrogen Peroxide soaks may clean out leaking plasticizer. The length of time any treatment will be effective before needing to be repeated varies. Most collectors choose to quarantine infected items from the rest of their collection. Contact with other plastics can exacerbate the problem. "As with cellulose acetate, plasticizer is lost by evaporation and leaching, and through loss of compatibility through changes to polymer and/or plasticizer. Additionally, changes in compatibility of the plasticizer may have been brought about by adsorption of liquids applied to the surface in the form of cleaners and polishes . 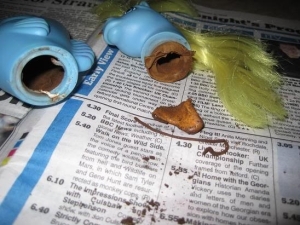 . . 'Squeeky' toys and dolls molded from PVC pastes were often found to have a 'tacky' surface due to exudation of plasticizer, and to have stiffened considerably." ​​For inexplicable reasons, ponies have metal parts inside them. These metal washers and weights rust over time. OxiClean baths will often remove rust. For stubborn cases, try CLR or Rit Rust Remover. You can use pipe cleaners, bottle brushes, long q-tips, or similar items to really get in there and scrub. I personally put a little bit of OxiClean directly into the ponies body, making certain some gets into all the little spaces. I fill the body with hot water and let it bubble for awhile, then rinse. This usually gets all the rust and gunk of of the tiny crevices that are super hard to reach. Make sure to remove the weights and washers from their bodies and tails so they don't rust again. Removal and replacement of tail washers and rust tails are discussed in the hair section of the site. It's safest to use cool water when cleaning so soft ponies as hot water may loosen their glue. Dawn dish soap rubbed on with a soft tooth brush will remove most dirt and even dried stains from so soft ponies. Wet the pony first then apply the soap. GENTLY scrub with the toothbrush. Pat as much water off them as you can with a towel or napkin. When the pony is dry, gently brush the flocking with a dry soft toothbrush to re-fluff the flocking. If you need a stronger cleaner, the spray on version of OxiClean can safely be used on so softs. Many collectors also use spray on carpet cleaners. ​​For more heavily stained, or completely yellowed so softs, some collectors have had luck whitening them with a bleach bath. 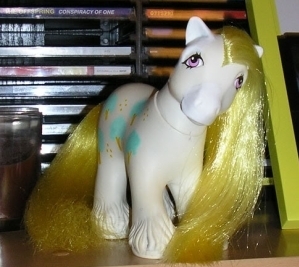 Use bleach with caution as other collectors report bleach having made their ponies even more yellow. The amount of bleach seems to be pretty arbitrary, but over all people seem to use a pretty weak bleach/water solution. This is often used in conjunction with sun fading. Be extremely careful as the bleach may fade the ponies' hair, so don't let them soak for too long, and this cleaning method seems to be safest on white ponies. Be certain to thoroughly rinse off any chemicals you use and it's best not to use hot water on so softs. Other cleaning methods collectors reportedly have had luck with include soaking so-softs in water and Oxi-Clean, running them through the washing machine wrapped in a pillow case, and the much gentler cleaning them with cool water, a soft toothbrush, and baking soda. 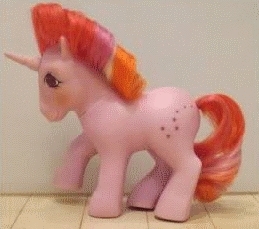 Be careful as any cleaning method you choose can remove flocking depending on the condition of the pony's glue. For tougher glue, try Acetone and Jasco. Wear rubber or latex gloves while doing this as this method uses multiple nasty chemicals. Also be sure to work in a well ventilated area and follow all directions provided on the product’s label. First, soften the glue that is holding on the flocking soaking the pony in an OxiClean bath of hot water. Scrub off as much of the flocking as possible using your fingers or a toothbrush. If you choose to use a brush, be careful not to scratch painted areas like eyes and symbols. Rinse the OxiClean off your pony once finished. 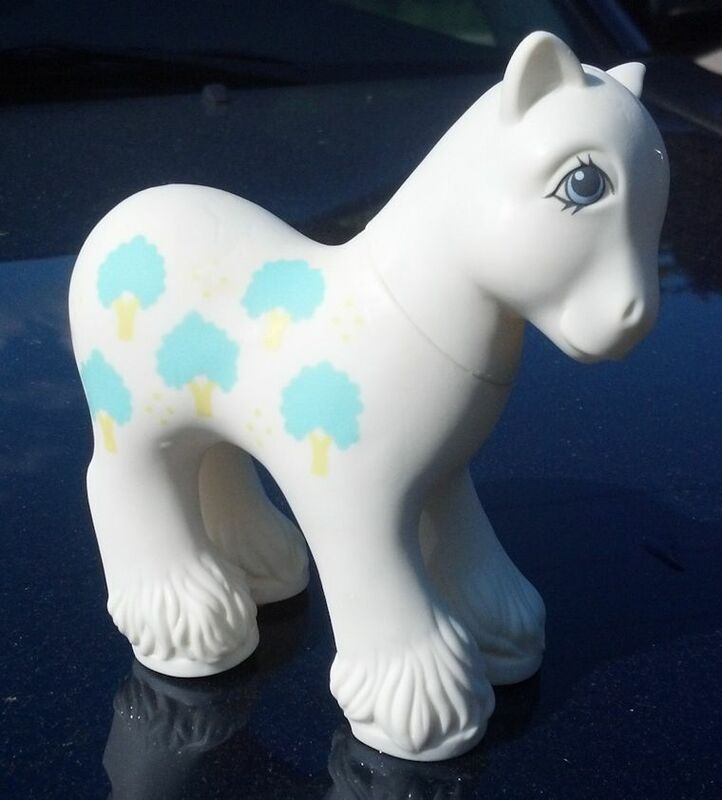 Next, using cotton balls, rub the non-painted areas of the pony with Acetone. Do not let it touch any painted areas as it will take the paint off. Once various body parts are wet with the Acetone, you can GENTLY scrape off the flocking and glue with a sharp object. You can soak non-painted body parts directly in the Acetone to help them soften more quickly, but acetone is damaging to pvc so don't leave for too long. 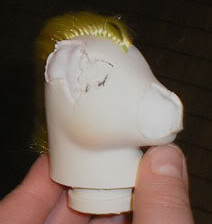 Use Acetone and or a gentle sanding to remove any excess glue from the pony. Rinse the pony again, also washing it with Dawn dish detergent as needed. Wet the painted areas of the pony with Jasco. 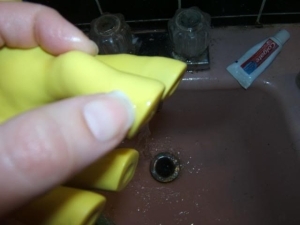 Remove the flock off the painted areas by scrubbing them with a cloth, cotton ball, or soft toothbrush. The Jasco miraculously doesn’t remove paint from the pony, but be careful not to scrub so hard that you scratch the paint. Also, use your common sense, it will remove symbols and eyes if you aren't careful and can discolor the vinyl if left on. Leaving it on for a just a few seconds, rinsing then repeating as necessary is probably safest. Rinse the pony again, also washing it with Dawn dish detergent as needed. 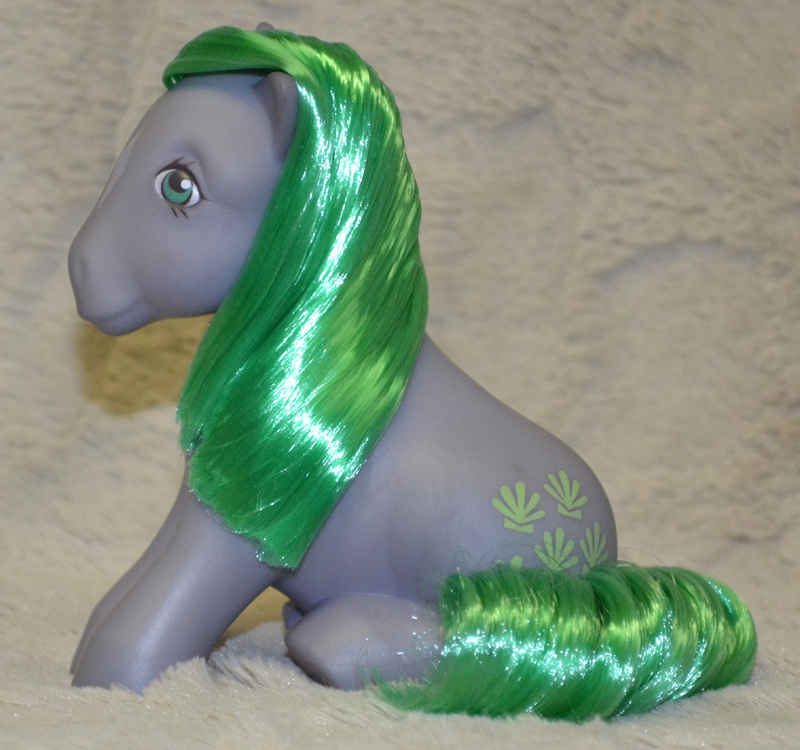 You’ll probably need to condition your pony’s hair once this is finished. Contact your city or county to find out how to properly dispose of your left over chemicals. You should never dump chemicals down the drain. ​​Try Mr. Clean magic erasers and Dawn dish soap first for a good surface cleaning. Be careful over painted areas as magic erasers can rub them off. You can clean over them, just don't rub too hard. 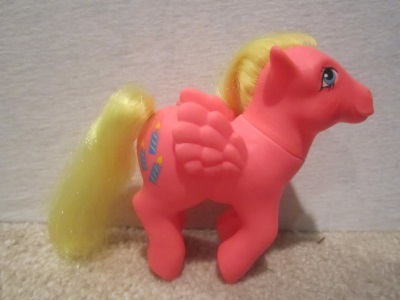 It's really amazing the marks magic erasers can get off of ponies. Rub at tougher stains and marks with a q-tip and nail polish remover. Nail polish remover with acetone tends to work best. 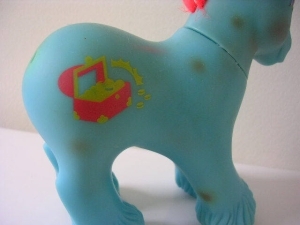 Be careful not to get any of the remover on the painted areas of the pony as it will take them off. Photos courtesy BabyIceCrystal. Sun-fading will fade many stains completely away, and is usually the next thing collectors try before harsher chemicals.. Cover everything but the affected area especially areas that will fade such as hair, symbols, and eyes, with paper towel and leave the pony in direct sunlight for as long as needed. This can go very quicky in areas with intense sun, or take months in cloudier areas. Aluminum foil is often used to cover the pony's body, but this can have a yellowing effect on their vinyl. Sun-fading also works well to lighten the bodies of ponies who have yellowed over time. This technique is usually used on white ponies, but can also brighten colored ponies. Use aluminum foil or painter's tape for delicate surfaces to cover all painted areas. Be careful when using painter's tape on glitter symbols. There have been reports of it removing the glitter. As with marks, the amount of time varies that the pony will need to be left in the sun. This photo, courtesy of Relcelestia, shows the difference sun-fading can make. The body has been sunfaded and the head left alone to show the contrast. The time this takes is certainly worth it! "A little about the science behind fading: What causes fading? Photodegradation. ﻿It is all about the chemical makeup of an object. The technical term for color fading is photodegradation. There are light absorbing color bodies called chromophores that are present in dyes. The color(s) we see are based upon these chemical bonds and the amount of light that is absorbed in a particular wavelength. If everything else fails, products like Removzit and acne products containing 10% benzyl peroxide, such as Clearasil or Persa-gel, can remove many tougher stains. Rub the affected area with your chosen product and let sit 15 - 30 minutes. Rinse and continue to let the pony sit. These will usually continue to lighten the area for awhile after the product has been removed. Repeat as necessary. Be extremely careful not to leave the product on for too long as it is possible to over-bleach the stain. These are harsh treatments and can fade or yellow the bodies of ponies. It's always best to test in an inconspicuous area. RemoveZit is great at removing stains, and the dye coloring a pony is simply a stain. 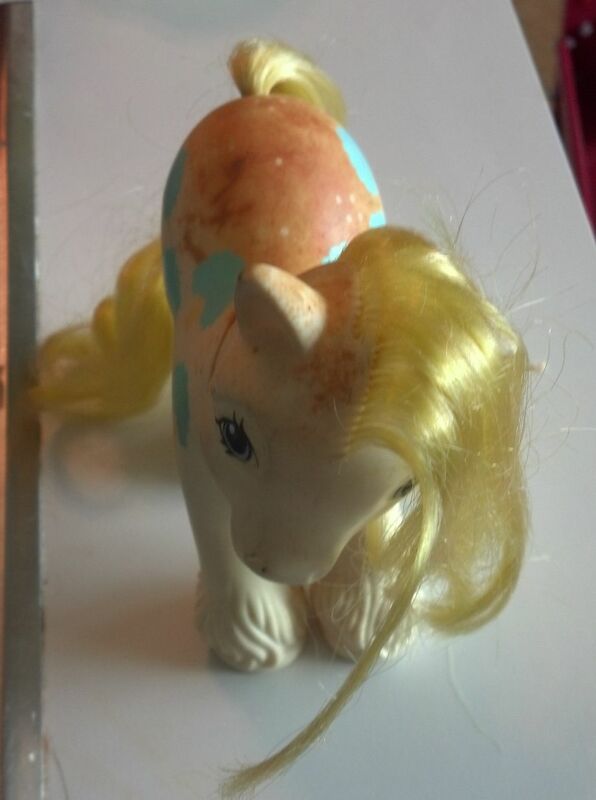 Severe discoloration can occur with these products and the chemicals can leach on to other ponies if they touch. 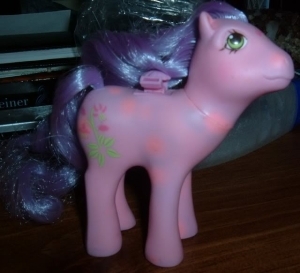 Many collectors will not buy a pony if these products have been used on it. 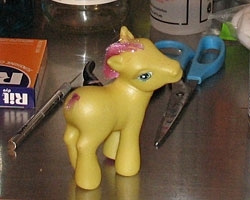 Creams can sometimes whiten yellowed ponies when other methods don't work. See BlackCurtain's experiment: I've Replicated Pindot (lots of pics) (be aware that these spots CAN also be caused by fungi). 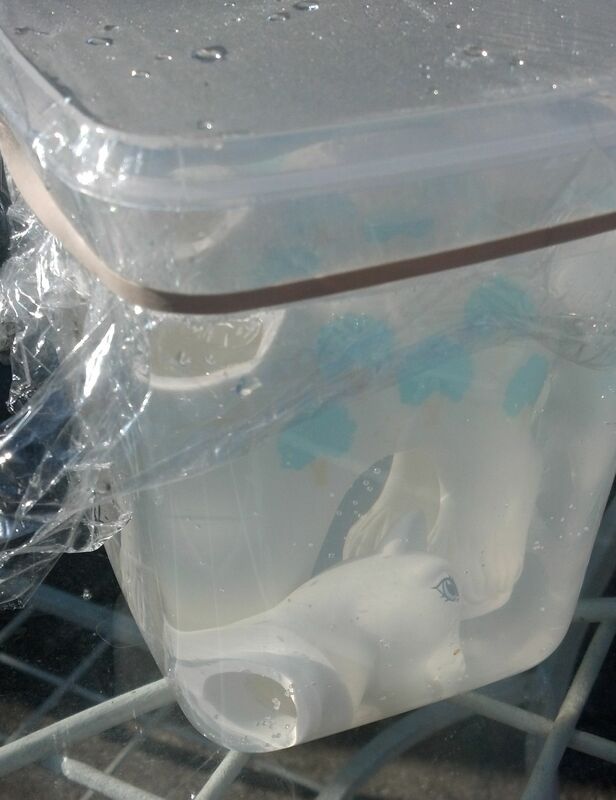 Simply leave your stained pony soaking in a clear container of Hydrogen Peroxide exposed to the sun. You can get Hydrogen Peroxide in the pharmacy section of any store. The amount of time you need to leave the pony soaking will vary by the amount of sunlight in your area. Peroxide breaks down into water and oxygen quickly when exposed to sunlight, so you may need to change the solution when it's necessary to leave a pony soaking for long periods of time. This can often be used with ponies who will burn during regular sunfading. See the Hydrogen Peroxide section of the Materials & Directions page for information about the pros and cons of using this chemical. When it cannot be removed by other methods, discoloration and even lots of marks and stains can be painted over. This Majesty was restored using a full body re-paint. Photos courtesy Jennifer H.
If you'd like to re-flock your deflocked so soft pony, here is a lovely tutorial by CherryCake on how to do so: So Soft-Ifying Applejack. Flocking is available at various craft stores and online. You can order it at restoredoll.com or at Hobby & Craft Flocking and Supplies. So far, no craft flocking has been found that matches the texture of the original so soft flocking. You can use the craft flocking to touch up rubs on your so soft ponies, but the texture will not match and the difference is visible. This is when a ponies legs are bent in a funny way that prevents it from standing correctly. They may also have dents in their bodies. 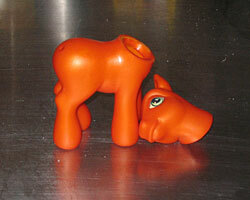 A great suggestion, courtesy ladyphoenix9, is to take off the ponies head and fill it with boiling water. Let the pony sit until the water cools, then dry the pony out. 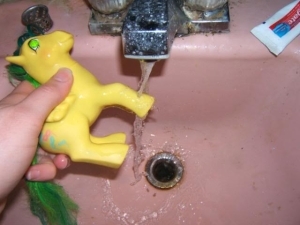 If this works properly, the water will reshape the pony's body. Other methods involve boiling the pony, then stuffing paper into it to help it hold its shape while it cools. Hathorcat recommends popping the pony in the freezer while it's still hot to help the shape set. ​​When the issue is with the legs, usually putting something between them and letting the pony sit for a period of time will shape the legs back into place. Light + ponies (and other items that have pigment or dyes) = photodegradation." Some vinyl will burn during sunfading, please read Who Shouldn't Be Sunfaded? and List of Ponies Safe/Unsafe to Sunfade? Photos courtesy Eldarwen. This photo was originally provided 2/21/2013. On 12/4/2016 Eldarwen reported that the pony is still in as good of condition as the "after" photo. Photos & tutorial courtesy Maycrestmom (with a few updates from me). In this thread: Deflocking Advice?, there's alot of good info an additonal tips about de-flocking. Theories on the cause of these marks range from thousands of marauding pink highlighter wielding children set loose during the 80's, a type of regrind, and contact with pink accessories such as saddles, bridles, and shoes. There is also a type of fungus which waste products cause a red or pink stain. It usually lives inside a vinyl doll and the staining is caused when migrating plasticizer pulls the stain to the surface of the doll. Sunfading and other stain removal techniques will often remove these stains. If the stain is caused by a fungus it may reappear as the movement of plastisizer brings more of the waste to the surface of the pony. Be sure to clean both the inside and outside of your pony to kill the fungus. Yellow marks are often caused by bleeding from chartreuse hair. 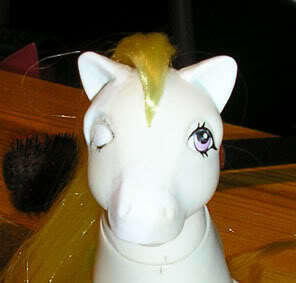 hair from touching the pony's body will help prevent this from happening. It can usually be sun-faded away. Photo courtesy elish2. Hathorcat recommends a vinegar treatment to help set the color if you want to prevent bleeding due to environmental factors such as humidity. Please note, this will help, but won't fix the problem entirely. 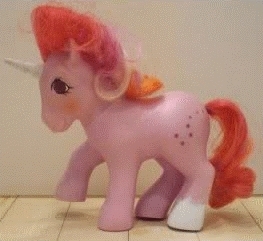 Place acid-free tissue paper between the hair and the pony's body during storage. "Cures" for age spots include painting over the spots to hide them, or a hydrogen peroxide/sun soak. Painting the spots will not prevent their spread, but when the colors are matched perfectly, you can't tell the pony has been painted. See the Materials/Paints section. See: Materials and Directions/Hydrogen Peroxide to read about potential side effects. My Results: Here (I've done this multiple times since this was posted with great results. I'll be updating the my collection section soon-ish with these photos. Baby MoonDancer photos courtesy Keira Wheeler. 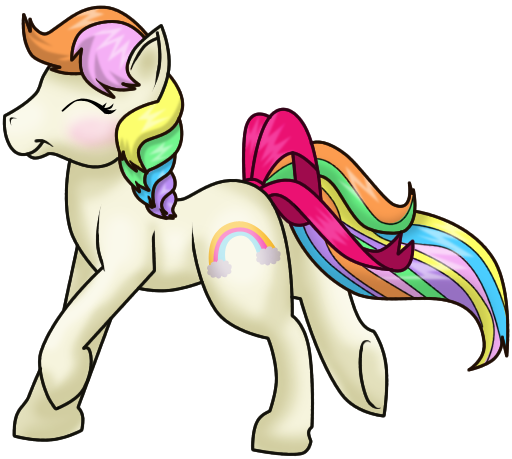 Rit Dye is a very popular product for any sort of dye project involving ponies. It comes in liquid, crystal, and powder forms. You’ll have to decide for yourself which version you’re the most comfortable working with. It will stain surfaces and containers so be sure to cover counter tops and such with newspaper and use bowls and containers that will not come into contact with food. Before trying these methods, please read: Acne Cream Results , Benzoyl Peroxide on G1s? and the Materials section of the site. Regrind is believed to occur in vinyl where Hasbro "recycled" old vinyl by melting it and mixing it with another color. It starts to show up as the vinyl ages and the colors separate. Unlike pony cancer or mold, regrind appears in large colorful blotches. It won't spread to other ponies and currently there is no known cure. The only option right now is to paint over it. Attempts to dye it usually end up with a pony that is darker in color, but still has mismatched blotches. There is more than one report, especially in flutter ponies, of regrind changing the pony to an entirely new, uniform, color.​​ Photo courtesy Avea2006. 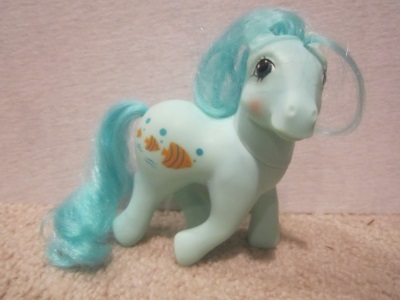 Photos courtesy Ringlets: How do I take apart/fix/clean out a seapony? To remove sea pony weights, first remove their head. A lot of times the weights are loose and will fall right out. Sometimes they have one weight inside, sometimes two. If the weights do not come out easily, use a tool like needle nose pliers, tweezers, or hemostats to pull them out. 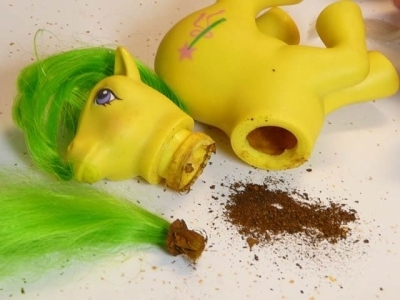 At this point, your pony is probably going to need a really good internal cleaning. 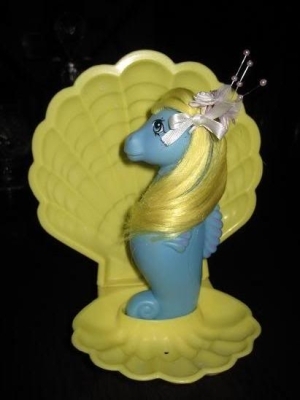 If you'd like the pony to float correctly, a great tip from Whizzer19 is to put a glass marble in her tail. This will keep it from rusting again. See the section on sun-fading under "stain removal" to see an often practiced method for whitening yellowed pony bodies. You can also remove stains and lighten yellowed vinyl using a hydrogen peroxide (H2O2)/sun fading treatment. 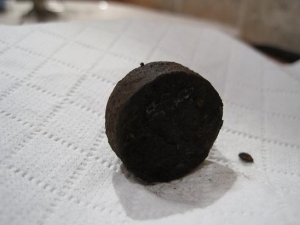 Photos courtesy Himmie and thanks to Templeflower for being the first to recommend this method for the site. ﻿De-flocking a so soft isn't exactly a restoration, but sometimes their flocking is just beyond hope. For these so softs, de-flocking is often a second lease on life. A brightly colored very pretty second life, it turns out. They're actually quite colorful under all that yellowed flocking! If the pony's glue has broken down, then you may be able to do a complete deflock simply by soaking the pony in hot Oxiclean then rub the flocking of with magic erasers and a stiff toothbrush. ﻿This Rapunzel was repaired using Sculpy Mold Maker as discussed by PurpleGlasses at the MLP Arena. She also recommends Alumilite Amazing Mold Putty. Many of these spots can be removed using a hydrogen peroxide/sun soak. You simply fill a clear jar with hydrogen peroxide and leave the pony soaking in it while exposed to the sun. The amount of time you leave the pony out will vary by the intensity of the sun in your area. The peroxide bubbles when working and not all spots show the bubbles. I suspect that this works when the spot is a stain caused by something like dirt, bacteria, mold, etc., and the peroxide is cleaning out the stain. When the spot is caused by discoloration from exposure to sulfur or chlorine, the peroxide will have no effect. Faded vinyl can also be dyed using artist marking pens when you want to mix a very specific color and/or only dye a specific part of the doll. I don't know that this has ever been tried on ponies. Please email me and let me know your results if you try it. If you want to sunfade a large section of a pony's body, you can protect the painted areas by covering them with watery acrylic paint. Cover the painted areas directly with white paint, then wipe off with a soft wet cloth and/or rubbing alcohol once finished (use caution on glitter symbols). You can also cover the area with clear cling wrap and the body will still fade. You can cover areas you want to protect with any color of paint and this is safe for glitter symbols. 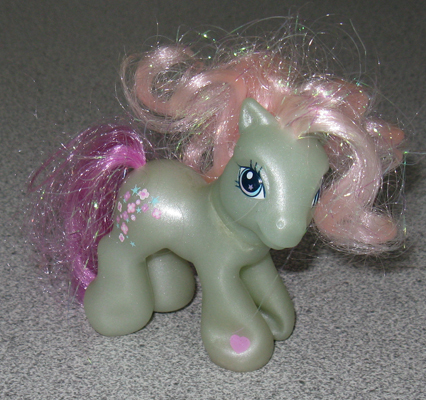 Glitter on ponies' symbols will often rust and cause stains that look similar to age spots. Treatments for this are the same as age spots, a hydrogen peroxide/sun soak or paint over the spots to hide them.